Boulder, Colorado-based Cholaca was founded in 2012, by Ira Leibtag, with one dream in mind: to bring healthy, organic and regeneratively farmed liquid cacao to the masses, while curating sustainable economic partnerships with farmers throughout Peru and Ecuador. Cholaca is pure liquid cacao made from one of the planet’s most nutrient-rich superfoods. This delicious product, available as a liquid or in baking wafer form, is also a natural stimulant and mood enhancer that can be enjoyed on its own or in various recipes. It is vegan, gluten-free, dairy-free and paleo-friendly! Cholaca comes in a few varieties and is made from only a couple ingredients with no preservatives, emulsifiers or additives. You will love this pure, cacao perfection! Looking for gluten-free recipes? Check out recipes like this BBQ Chicken Focaccia Pizza. Canyon Bakehouse’s new Heritage Style loaves are huge. Literally. 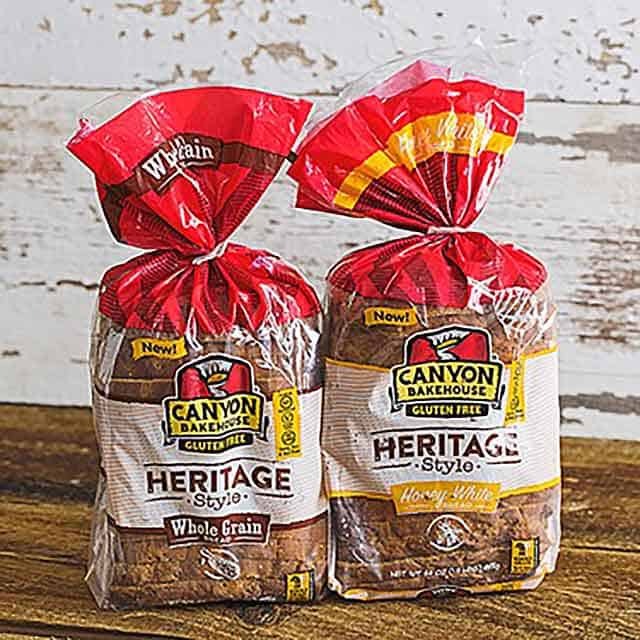 Rooted in the tradition of family-style, artisan-made loaves, the new Heritage Style breads honor the Canyon Bakehouse standard for non-GMO, whole-grain and clean ingredients—and now offer a big, new take on what it means to eat gluten-free. Video description: Learn more about Canyon Bakehouse Heritage Style Breads. Bounce Protein Energy Balls are nutritious, delicious, and convenient snacks that you can feel good about grabbing and are a smart choice for the whole family. Bounce believes that instead of indulging in empty calories, purposeful snacking contributes to a nutritionally balanced day. The company strives to inspire people to make positive changes in the way they eat, think, and live by creating snacks that not only taste great but also sustain people with long-lasting energy and the fuel to “Grab Life!” All of Bounce’s products are non-GMO, certified gluten-free, and are kosher. They contain no artificial flavors, colors or preservatives, and are vegetarian-friendly, with their Superberry flavor being perfect for those who follow a vegan diet. Everything that goes into a Bounce Protein Energy Ball is selectively chosen for its nutritional value. Bounce Protein Energy Balls are perfect for those who are health-conscious and on-the-go. They’re a great way to stay satisfied between meals and make for a wonderful after-school snack. Whether you’re at the gym, hiking, running errands or at soccer practice, Bounce Protein Energy Balls will keep you rolling. Connect with Bounce! Video description: Learn more about Bounce Protein Energy Balls. Opal is no ordinary apple! This bright-yellow apple features a distinctive crunchy texture and sweet, tangy flavor. However, the most incredible, unique and natural feature of this non-GMO apple is that it doesn’t brown—making it perfect for lunchboxes, salads, baking and, well, just about any other apple recipe you can think of. One important difference, that can’t be seen or tasted, is a portion of Opal Apple sales goes to nonprofits through its Youth Make a Difference Initiative grants. These grants are available to youth-led nonprofit initiatives surrounding food security and politics, nutrition, agriculture and education. Hurry and get some Opal Apples now because they are only available from October through June. To learn about Opal Apples, where you can find them and the causes they support, visit their website and like their Facebook page. Mix the apples, cabbage, carrot and green onions and toss in the mixture of the yogurt, cider vinegar, maple syrup, Dijon mustard, garlic, salt and pepper. Option: Replace the Greek yogurt with 2 tablespoons of oil for lactose-free version. Tip: Use a mandoline to quickly shred the cabbage and slice the apples and carrots thinly in one direction and use a knife to slice thinly in the other direction. This recipe was developed by Closet Cooking. Connect with Opal on Facebook, Twitter, Instagram and Pinterest today! Spread the matcha LOVE® this Valentine’s Day and gift your special someone something that will keep them grounded no matter where the day takes them. Matcha is Japanese green tea leaves that are steamed, dried and finely-ground into a tea powder. The natural caffeine and L-theanine found in matcha takes effect throughout the day, giving you the extra “boost” you need to tackle your daily tasks and stay focused while doing so. Offering versatile products that can be effortlessly incorporated into any hectic schedule, matcha LOVE’s Culinary Matcha is perfect for creating savory dishes, baked treats or even a tasty matcha smoothie. For those who seek to celebrate the traditional way, the brand offers ceremonial-grade tea powders that give a modern take on an ancient ritual. And, if you’re on-the-go, matcha can also be found in ready-to-drink formats like bottles and shots for quick, yet gentle boosts of energy. Melt your Valentine’s heart and taste buds by whipping up a delicious matcha latte—perfect to be shared as a couple or for dipping with matcha-glazed biscotti! Visit www.matchalove.com and follow on Twitter, Instagram and Facebook for more information on all things matcha! Add the almond or soy milk to a small pot over medium heat and bring to a simmer. Place 1 teaspoon of matcha LOVE® Culinary Matcha powder in a heatproof cup. Slowly whisk in 1/4 cup boiling water, then the milk, tipping cup slightly to help create more foam. Sweeten with agave syrup to desired sweetness. Preheat your oven to 375°F. Line a 13×9-inch baking sheet with parchment paper. In a medium mixing bowl, whisk together the oil, eggs, and sugar until the sugar has dissolved. In a separate bowl, whisk together the flour, baking powder and salt. Pour the flour mixture into the oil mixture and stir until just combined. Pick up the dough and roll it into a ball. Place the ball on the lined cookie sheet and use the palms of both hands to roll it out into a cylinder as long as the baking sheet. Use your hands to press the dough down to 1/2-inch thickness. Bake for 25–30 minutes, rotating the sheet pans halfway through, until the dough is lightly browned. Cool on a rack for 10 minutes, or until it is cool enough to handle. Slice the dough crosswise into 1/2” slices. Place the slices cut-side up back on the cookie sheets and bake for another 7–10 minutes per side, until golden brown around the edges. * Cool the biscotti on a rack. Either drizzle the glaze over cooled biscotti, or dunk the cookies right into the glaze. Let stand for 15 minutes to allow the glaze to harden. Store in an airtight container for up to 1 week. *Note: The biscotti will harden a bit after it comes out of the oven, so it’s okay if it still feels a little soft in the middle. 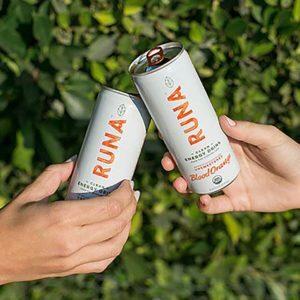 RUNA is an energy drink brewed from guayusa (GWHY-YOU-SA), an Amazonian tea leaf with the power to revitalize both you and the rainforest. For thousands of years, guayusa has been a vital part of Amazonian culture. They describe the energizing effects or drinking it as making them feel “Runa”, which translates to “fully alive.” It’s naturally caffeinated and contains polyphenol antioxidants that together provide a clean, sustained energy. The best part is that the cultivation of guayusa helps protect and reforest the rainforest. Guayusa is shade-grown which means we have to both preserve existing rainforest and plant more as we grow. We are the proud winners of the World Wildlife Fund’s Global Impact Award for the Most Innovative Solution for Tropical Forest Conservation. To date, we’ve planted over a million trees and are the largest reforestation effort in the Ecuadorian Amazon. It’s simply letting nature be nature. In the environment it’s called symbiosis. For RUNA it’s called a unique way of doing business that’s inspired by the natural world. The result is a refreshing, energizing beverage that is organic, Fair Trade and beneficial both to the rainforest and to the people who live in it. Are you ready for a 1980s flashback? Original New York Seltzer—the iconic sparkling beverage known for its signature rounded bottles and crisp, natural flavor—is now available at your local Sprouts. New York Seltzer is bringing back the authentic taste you remember. Flavors like crisp and bold Black Cherry, bright and bursting with flavor Raspberry, refreshing like a summer day Peach, and smooth and silky Vanilla Cream are sure to excite. Original New York Seltzer is made without artificial flavors, colors or preservatives. Crisp, clear and refreshing, they’re a welcomed remembrance to the era of neon hues and hair bands. Video description: Original New York Seltzer commercial featuring song “Lord I Miss You”. It started in 1980 when founder Jimmy Rosenberg picked an orange from a tree in his backyard. Just one handpicked orange, squeezed into pure juice perfection. That’s when the pursuit of the authentic juice experience began. Evolution Fresh believes in a different approach to making juice—the cold-pressed way. Cold-pressing, using high-pressure processing, helps protect the flavor and nutrients of raw fruits and vegetables. That way, each juice tastes as close to fresh picked as possible, with no added colors or flavors nature didn’t put there. The produce is locally sourced, with over 80 percent of fruits and vegetables grown within 400 miles of the juicery in Rancho Cucamonga, California, where it is cleaned, squeezed and pressed. Once juice blends are crafted and bottled, pressure equal to five times that found in the deepest part of the ocean is applied to help protect flavor, color and nutrients while ensuring safety. In addition to a unique approach to juicing, Evolution Fresh works with ingredient-sourcing specialists who have over 50 years of combined experience operating with produce experts and growers around the world. Now, decades after picking that first orange, Evolution Fresh still pursues authentic juice experiences every day. That’s why their juices are cold-pressed, using high-pressure processing, to provide nutritious and delicious options for every step of the wellness journey. To health and happiness! Video Description: Evolution Fresh: Juices Cold-Pressed with Purpose. Learn more about cold-pressing, high pressure processing (HPP), and the key differences from traditional processing techniques like heat pasteurization. Cooked Perfect Meatballs were created with the mission to share quality and delicious meatballs with people who are looking for an easy meal to serve their families. Each meatball is crafted with select meats, aromatic spices and a custom blend of herbs. Uniquely, it is then flame-broiled to lock in flavor. A steadfast dedication to quality and serving families has made Cooked Perfect Meatballs the number one branded meatball in the U.S. Try Cooked Perfect Gluten-free or Turkey Meatballs today! Check out more Cooked Perfect Meatballs on Facebook.